I've always wanted to try cutting felt with my Cricut, and it turns out it's really easy! I made my card base with Elegant Edges, by welding two 5.44" oblong shapes together on my Gypsy. I added a couple of layers in decreasing sizes and ran the brown layer through the Cuttlebug. 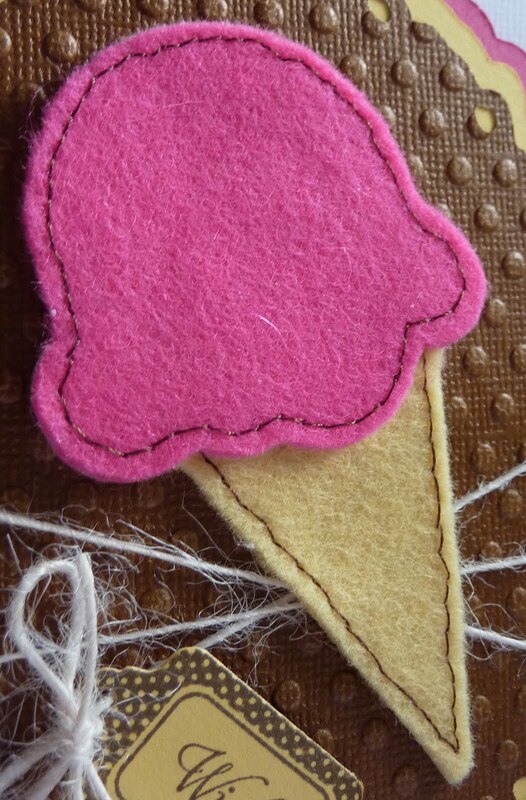 To make my ice-cream cone, I ironed some "Heat 'n Bond" to my felt and then cut the cone from Sweet Shop at 3.5" using the deep cut blade in my Cricut. I was surprised with how easily it cut! I then handstitched around the edges and adhered it together and to the the card with a glue gun. My little tag was made with a Papertrey Ink die and stamps, and I attached it to the card with some twine. Great job Katie, but then I love all things ice cream.. :) Have a great day. This card is just fabulous!! I need to try some felt on my projects. I love the look it adds to everything! I want some ice cream now! Beautiful, love the stitching very nice touch. This is so cute, I've always wondered how PTI's felt would cut with the Cricut---glad you tried it out!! This is truly an amazing card.. 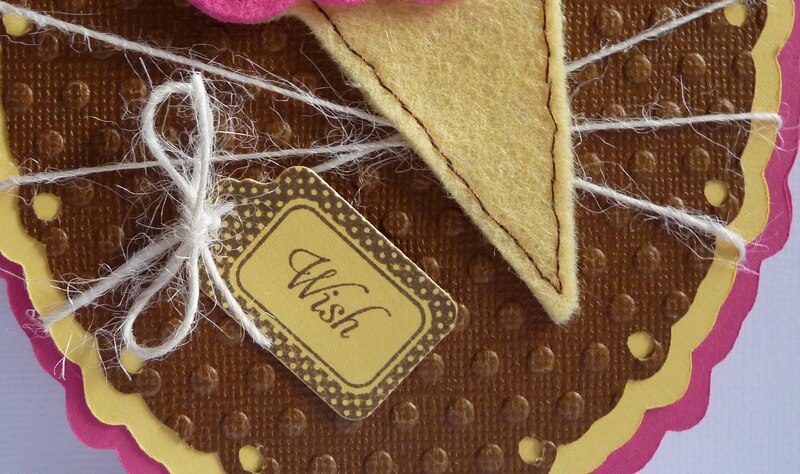 I love the "vanilla, chocolate and strawberry" colors and also the idea of incorporating felt onto a card. So creative! Too cute, Katie!!! I love the texture the felt gives your card. And the stitching is fab too. Well done!! Katie~this is fantastic. I have to try cutting felt sometime especially when you make it sound sooo super easy. Thanks for the inspiration! I love the look of the felt on your card Katie! Where can I get "Heat and Bond"? Thanks for sharing! WOW,Katie...awesome!! 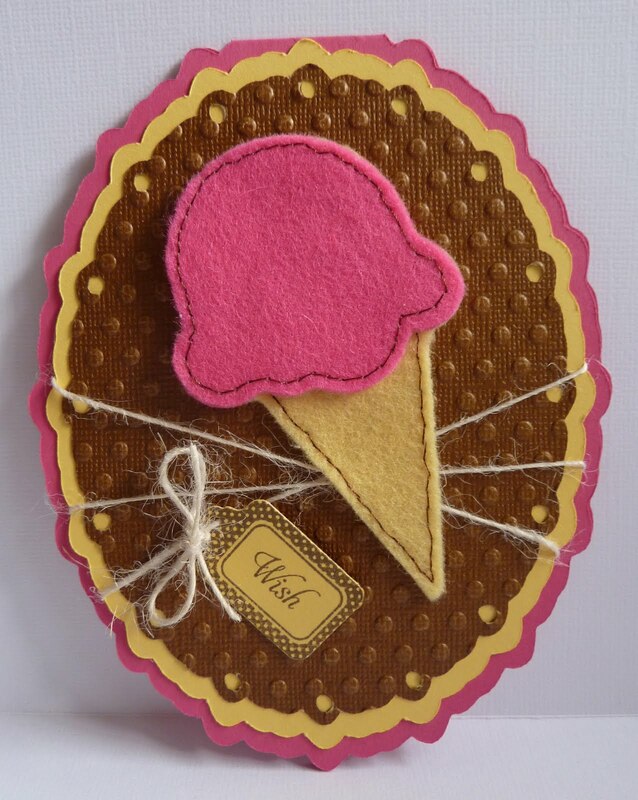 I love felt,so i totaly love your icecream here!! :) I love your embossing! !